OAK RIDGE, Tenn.—ORAU employees broke a record in their efforts to preserve the earth’s natural resources during the company’s annual Earth Day collection event. Employees recycled more than six tons of technotrash and paper this year. 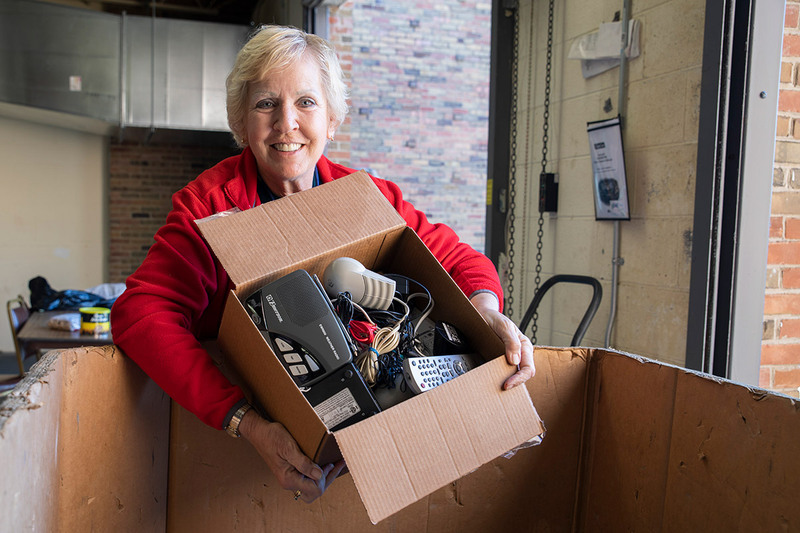 As part of the two-day event, ORAU accepted more than 12,847 pounds of technotrash (computers, related accessories or other electronic items) and paper for secure shredding. This year’s total broke 2017’s record-breaking collection by 1,157 pounds. More than 123 pounds of unwanted or unused medications were collected as part of Operation Medicine Cabinet in collaboration with the Allies for Substance Abuse Prevention and the Oak Ridge Police Department. The Drug Enforcement Agency will incinerate all of the medications collected. Additionally, 25 pairs of gently used glasses were collected for the Lions Club’s Recycle for Sight program, which distributes used glasses to people who need them. Finally, 2,275 pairs of shoes were donated to Funds2org in support of Helping Paws Animal Network, an animal welfare organization started by ORAU employees. HPAN will receive 40 cents for each pound of shoes recycled. Other items collected include 87 pounds of alkaline and rechargeable batteries for reclamation and 75 lightbulbs for recycling. ORAU hosts the annual event to encourage employees to bring in unwanted items from home for recycling or reuse. Since 2010, ORAU employees have recycled more than 39 tons of material from their homes as part of the company’s Earth Day recycling and donation events. As an organization—whose corporate office building in Oak Ridge was the first new, gold-level, LEED-certified office building in Tennessee—ORAU also maintains its environmental commitment through recycling. In 2017, the company recycled 60 tons of materials, marking a continuing trend of recycling more than it throws away. ORAU’s recycling efforts have been so successful that the net weight of recyclables exceeds what ORAU sends to landfills.